Saint Helena, Ascension and Tristan da Cunha is an Overseas Territory of the United Kingdom in the southern Atlantic Ocean comprising the island of Saint Helena, Ascension Island 700 miles to the north, and a group of islands 1,300 miles to the south, of which Tristan da Cunha is the only one with a settled population. Gough Island has a meteorological station maintained by the government of South Africa. Inaccessible Island and the three Nightingale Islands are uninhabited. It was previously known as Saint Helena and Dependencies until 01 September 2009, when a new constitution came into effect giving the three islands equal status within the territory. Saint Helena was discovered in 1502 by the Portuguese navigator Juan da Nova Castella, probably on St Helena's Day. It was settled by the English East India Company in 1659, and used by its ships as a port of call, mainly on the return journey from India to England. Between 1815 and 1821 the island was lent to the British Government as a place of exile for the Emperor Napoleon Bonaparte, who died there on 05 May 1821. It was ceded to the British Crown in 1834. The first flags associated with the island were the Union Jack, the Red Ensign, and the East India Company's red and white striped ensign. This striped ensign could be used by company ships until 1824, but only when south of St. Helena. In the early 1870s defacements for the Union Jack and Blue Ensign were introduced into British colonies. The defaced Union Jack was hoisted on any vessel carrying the governor within the waters of the colony, and the defaced Blue Ensign was for vessels operated by the government of the colony. The undefaced Union Jack flew over Government House. 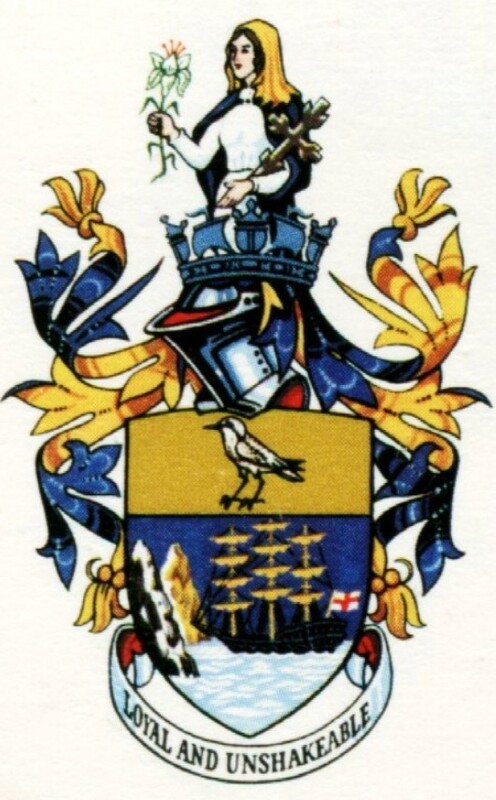 The badge of St. Helena was derived from the Public Seal of the colony; the Royal Arms above an ornamental frame surrounding a picture of a three-masted ship near the base of steep cliffs. Its sails are furled and a flag flies at the stern. As originally drawn, when the badge was introduced in 1874, the flag was a White Ensign, but in later copies the canton was often left blank so that it appeared to be the English flag. It is often assumed that the ship is an East Indiaman, but this was obviously not intended. When constructing a badge from the colonial seal, the usual procedure was to extract the scene from the frame and refashion it into circular form, as in the contemporary badges of Barbados and St. Vincent. In the case of St. Helena the scene was taken from the seal without any modification and included the decorative frame and also a pink ribbon draped across the top. In the seal, the ribbon was actually the lower part of the British Royal Arms, being the scroll which bore the motto "Dieu et Mon Droit"
Some drawings show the badge in a white circle on the Blue Ensign, but this is wrong. In flag books colonial badges were usually drawn as separate items, not as part of the flag on which they would be placed. For convenience they were framed within a circle, which, surrounded by a green garland, was how they appeared on the Union Jack of the Governor. It did not necessarily mean that the badge appeared in a white circle on the Blue Ensign. A note added to the 1916 edition of the Admiralty Flag Book explained that, "The white circles are not to appear on the Red and Blue Ensigns except where they are necessary to display the design; e.g. where the badge itself has a border of the same colour as the ensign." In a letter dated 03 April 1919 the Governor of St. Helena wrote that, "the badge has a light coloured background and there is no white circle". After 1944, in common with other colonies, the defaced Union Jack replaced the plain Union Jack as the Governor's flag on land. 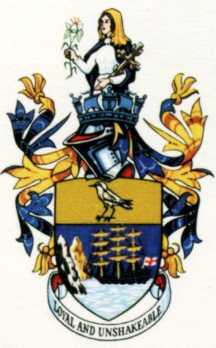 The Arms were granted by Royal Warrant published in the St. Helena Government Gazette on 30 January 1984. The shield of the arms, with no white disc, was approved as a defacement for the Blue Ensign soon after this. A plover, charadrius sanctaehelenae, known locally as the Wire Bird, is in the upper part of the shield, above a revised drawing of the coastal scene that formed the original badge. The defacement on the Union Jack of the governor has the same shield, but also the scroll from the arms bearing the motto LOYAL AND UNSHAKEABLE, set on a white disc surrounded by a laurel-leaf garland. There is no authorised Red Ensign defacement, so an undefaced British Red Ensign is the proper ensign for merchant vessels registered in St. Helena. All text above thanks to David Prothero, revised 13 January 2002. By the way, the French flag has been flying over St. Helena since the Longwood Estate, where Napoléon died, has been allocated to France by the British. In 1999 the British Ministry of Defence (MoD) department in charge of flags, the DCTA, decided, in consultation with the College of Arms, that the badges on many British flags were too small for identification. They also did not match the newer flags granted directly by Queen Elizabeth II, through the College of Arms, which have much larger badges. So the MoD decided to make the badges much larger on various ensigns, including that of Saint Helena. The size and placement of badges on British ensigns is a decision in the power of the Admiralty, and passed to the MoD when the Admiralty ceased to exist as a separate body. When constructing a badge from the colonial seal, the usual procedure was to extract the scene from the frame and refashion it into circular form, as in the contemporary badges of Barbados and St Vincent. In the case of St. Helena the scene was taken from the seal without any modification and included the decorative frame and also a pink ribbon draped across the top. In the seal, the ribbon was actually the lower part of the British Royal Arms, being the scroll which bore the motto "Dieu et Mon Droit". On 30th January 1984 the St. Helena Government Gazette published an illustration and blazon of Arms for St. Helena and announced that the Earl Marshal had been commanded to register them at the College of Arms. According to the Office of the Chief Secretary, St Helena, the date on the Royal Warrant that granted the Arms is 04 October 1985. Flag books give 1984 as the date when the shield of the Arms was adopted as a Blue Ensign defacement, but a 1993 Flag Research Center information sheet on the St Helena Blue Ensign stated that ‘the date of authorization of the [new] flag badge is unknown; the flag is to be phased in during 1994 as stocks of the previous design are depleted’.” A plover, charadrius sanctaehelenae, known locally as the Wire Bird, is in the upper part of the shield, above a revised drawing of the coastal scene that formed the original badge. The defacement on the Union Jack of the governor has the same shield, but also the scroll from the arms bearing the motto LOYAL AND UNSHAKEABLE, set on a white disc surrounded by a laurel-leaf garland. The scroll was on the Governor’s flag in 1997, but has since been removed.